I've been getting cards and letters from people I don't even know. Okay, that's not exactly true. But lately I have been getting Facebook friend requests from total strangers, which kind of baffled me. 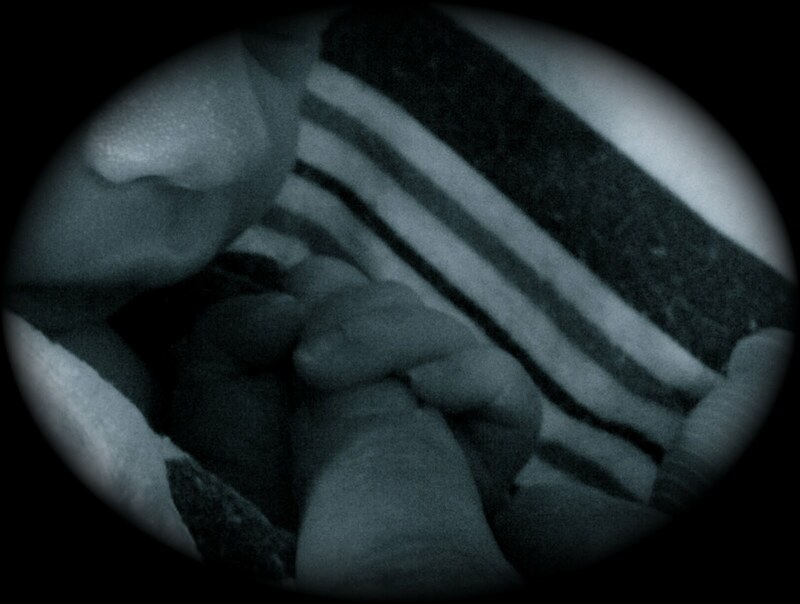 Remember, I now have a one-month-old son, so baffling me is easy these days. Ask me a question, and my first word will be, "Um..."
Then there'll be a 5-10 second pause. Then I'll pause again. I may even randomly leave the room. Then I'll ask you to repeat the question. Possibly from the other room. 2+2. These days, I question whether or not the answer is actually 4. Seriously, 22 is a totally reasonable answer to this. So anyway, I'm easily baffled - this we now know. And eventually, I figured out the influx of odd friend requests. I was probably getting these because I wrote a book, a few people have actually read it, and this is what they do if they like it. They understandably want to link up to whatever author, musician or artist makes a positive impact. I was not so prepared for this. So here I am now, scrambling to oblige all comers. See, I am by nature a private person, yet achieving my goal of becoming a published author has put me in a very public place. I have absolutely no complaints about this, but I've also struggled to tiptoe the privacy tightrope. Just what can I share that allows an audience into my life, while simultaneously not wholly compromising my family's privacy on such an open forum as the internet? To continue swiping the words of Glen Campbell: "There's been a load of compromisin' on the road to my horizon." So in an effort to accommodate those I haven't yet met who wish to befriend me, I've succumbed to professional pressure, and have created a Facebook Author Page. Because truly, you're nobody until you're somebody on Facebook. And even then, you're still pretty much a nobody. You're just a nobody on a much more public stage. So please consider joining in on the Facebook fun - there should be some sort of badge linking to the page over on the right. Here I will try to keep everyone current with blog posts, reviews, events, contests, idle chatter about 80s culture, my secrets to maintaining health and sanity while sleeping two hours a night, and so on and so forth. From time to time, I'll probably also even give away Thank You For Flying Air Zoe swag. Some of it might even be useful! The above pic is a snapshot of my very first author table at last Saturday's Book Fair at the fantastic Firewheel Books and Beans in Everett, WA. I hope to chat more about the event in a future post, but if ever you're in downtown Everett, do stop by for great coffee, vinyl records, and excellent hospitality. And FYI, these limited edition Air Zoe flip-flops come with a 90 minute warranty. Act fast - these won't last long! No really, I'm pretty sure the stickers will fall off by September at the latest. Do stop by the Facebook page if you have a moment, and as always, thanks for flying! When did you attend your first concert? Who did you see? Mine was on March 21st, 1983. Spring had sprung on the closing curtain of my Junior High career, and we eighth grade adolescents were just weeks away from being full-fledged grown-ups. Or at least this is what we thought, so a few of us banded together to lobby our parents to let us see the crazy amazing concert coming to northern New England. For sure, it was a spectacular double-bill, featuring up-and-coming Brit headbangers Def Leppard opening for arena rock demigod Billy Squier. Yes, this is the second time in two weeks that I've mentioned Billy Squier in this blog. I don't understand it either. Anyway, this was the must-see event of the season, so we had to be there, even if it meant running away from home. Fortunately, we struck a hard bargain before arriving at this point. We were given permission to go, but we just needed one minor thing to come along with us. Sometimes being thirteen absolutely sucked. The tragic combo of a parent and a rock concert virtually decimated our Cool Kid Quotient. Yet it was sadly necessary given that the concert was ninety minutes away in the big city of Portland, Maine, and the only wheels we had were ten-speeds and skateboards. I can recall with complete clarity that our chaperone brought homework from her paralegal classes, and basically treated this epic event as little more than a TV show in the background. So while Def Leppard was bringin' on the heartbreak in the center stage spotlight, my friend's mom was studying dispute resolution and estate planning with a flashlight. Still, something magical happened even in spite of our chaperone's mortifying behavior. From the moment the lights and the music exploded, we were all electrified in a way we'd never experienced. Sure, we all competed to own the town's biggest boombox, and we thought we knew all about enormous sonic mayhem. But we knew absolutely nothing about pure energy until we were awash in the kinetic flood of rock and roll adrenaline. A first concert can be a powerful experience. Those of you who've read my novel know that the catalyst for its main character Zoe's rock star dreams was a concert she was snuck into as an impressionable kid - an evening with a then unknown pop/punk/new wave band out of L.A. called The Go-Go's. I'll go no further with story chatter, fearing my own excitement when discussing the novel will ultimately lend itself to me blurting spoilers of my own novel, which I'm told is a massive authorial foul. Suffice it to say, however, that Zoe's fictional New Year's Eve with The Go-Go's was a volcano of a night that turned her world upside down. Made me wish I was there, it did. Cut to over three decades later. Oh, and also cut to non-fiction. Imagine my surprise when this past April, I first looked at the summer schedule for a favorite local venue, and saw that The Go-Go's were coming to town, and they had scheduled a Sunday sundown show just down the street. Time was, this would've been an easy call for the summer to-do list. But given our new reality, we had to pause. Could we do this? After all, the date of this concert was less than a month after our firstborn's due date. Our August calendar was looking pretty full. Could we pull the trigger on what would surely be a sold out show, then hope against common perception that we could come up for air long enough to see at least one summer concert? Would The Go-Go's become our son's very first show? 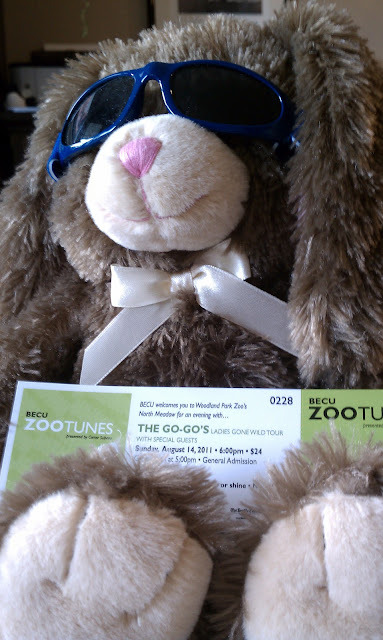 And look, we even bought a ticket for Eddie Rabbit, our little rock star's fave plush pal. I know what some of you may be thinking... "Wait, the boy is only three weeks old, isn't it a bit too soon to be taking him to a concert?" But if you look closely at the ticket, you'll see that it's at The Woodland Park Zoo. So you see, we're not actually taking him to a concert. We're taking him to the zoo! And if a concert happens to break out while we're there, so be it, we'll be ready! This coming Sunday. Gorillas and Go-Go's. Win-win. I am sure that decades down the road from here, our boy will be telling his own narrative about a first concert, and it will not involve The Go-Go's. No, his will probably either be a band that's in its fledgling stages in some suburban garage, or The Rolling Stones, who will inexplicably still be selling out stadiums at age eighty, even though Keith Richards has to be wheeled out onto the stage and propped up with backstage scaffolding. But whatever the venue and whoever the artist, it will likely leave an indelible fond memory, and what more could a parent want for their child? If I do have to chaperone, I won't get in your way. But if you need me, you'll probably find me dancing with your Mom somewhere near the back of the venue. Did it totally blow you away, or what? You just made a silly sound that was sort of a cross between a squeak and a sigh. I am thisclose to melting. And now I have no idea what I was going to say to you. None. Your charm is a magnet on my mix tape of thoughts. Whatever noise is going on inside my busy head gets wiped clean the instant you make a sound, share a wide-eyed expression, or even show off a little toot. Anyway, I'm hoping that maybe you’ll give me a moment to concentrate, so I can jot down a few things I'd like to say to you as you take on Week Two of your big adventure. Kiddo, your dad is a child of the 80s. There unfortunately is no way around this, and as you grow up, it will probably embarrass you at completely inopportune moments. I can tell you that I will try not to pick you up from the seventh grade dance while blasting Billy Squier’s The Stroke from the tape deck of a Toyota that should’ve been sold for scrap metal in 2001. But I make no promises. Because see, as you barrel through all of the speed bumps and potholes of youth, I’m certain I will watch with a sense of nostalgic pride. I've made a promise to myself - to remember as much as possible about what it felt like to be just like you. I want to recall the uncertainties of being a kid so that I can understand your troubles, fears and incredible sense of urgency. I want to never lose sight of how very vital everything feels during the emotionally dizzy days of childhood and adolescence. And most of all, I want to relate to you. I'm new at this parenting thing, but I'm pretty sure that this will take us both a long way. So when I pick you up from your Junior High dance, I will probably want to travel back to my own years dancing to cheesy 80s songs in the Junior High gym. By the way, for me, this "dancing" was characterized by a signature move of the decade - jumping off folding metal chairs and performing daredevil kicks & spread eagles reserved mostly for freestyle skiers, figure skaters, and a young David Lee Roth. You may think this move will show off your athletic prowess and impress the ladies. But trust me, it does not. For the record, I look forward to one day seeing your own baffling "signature move." And hey, speaking of impressing the ladies... Please do know that if you’re trying to win over the Junior High Winter Carnival Queen, I will gladly turn the car stereo down for you as I pull into the parking lot. Or at least switch the tape player from Squier's Stroke to Journey's Open Arms. I recognize that when courting a Carnival Queen, or any gal at all, ambiance is crucial, and nothing bursts with romantic crescendos quite like a well-placed Journey song. You laugh, but son, you can learn many important things from the culture of your old man’s youth. The Tao of 80s Tunes – a.k.a. Everything I Know I Learned From Watching MTV – is an undervalued doctrine of hidden wisdom and insight. Son, don’t lose your grip on the dreams of the past, you must fight just to keep them alive. Just dream those dreams, scheme those schemes, and hit them with your laser beams. We’ve gotta hold on to what we’ve got. It doesn’t really matter if we make it or not. We’ve got each other, and that’s a lot. We have to believe we are magic, and nothing can stand in our way, because there’s no one who can tame our animal style, and we won’t be caged by the call of the wild! So when you feel like you’re always in the dark, living in a powder keg and giving off sparks, just remember that we are all just children, fighting our way around indecision. And lastly, when a problem comes around, you must whip it. Little Guy, I could go on and on, but I'll spare you. After all, you're only nine days old. Everything probably feels a little overwhelming at the moment. But more than anything, I want you not to worry about navigating life's massive roadmap. Me and your mom - we've got your back. We joke about how because your birthdate was July 24th, we'll have to call you The 24/7 Kid. But I think what I want you to know most of all is that I aspire to be The 24/7 Dad. ...because you take me by the heart when you take me by the hand.